DARPA’s Towed Airborne Lift of Naval Systems (TALONS) research effort recently demonstrated a prototype of a low-cost, fully automated parafoil system designed to extend maritime vessels’ long-distance communications and improve their domain awareness. Towed behind boats or ships, TALONS could carry intelligence, surveillance and reconnaissance and communications payloads of up to 150 pounds between 500 and 1,500 feet in altitude—many times higher than current ships’ masts—and greatly extend the equipment’s range and effectiveness. Towed behind boats or ships, TALONS could carry intelligence, surveillance, reconnaissance and communications payloads of up to 150 pounds between 500 and 1,500 feet in altitude—many times higher than current ships’ masts—and greatly extend the equipment’s range and effectiveness. DARPA has successfully tested a TALONS prototype that can be deployed by hand from smaller boats, or by mast from larger ships. Before open-water testing, TALONS’ rapid development began with land-based testing near Tucson, Arizona, in June 2014, followed by mock-up testing and measurement near Assateague Island National Seashore in Virginia in December of that year. TALONS R&D began bench-testing the system in March 2015. Field testing on the water started in early May, and ran through June near Baltimore, Maryland, and Virginia Beach, Virginia. More than 20 TALONS flights were launched over that period, testing the system under various wind conditions and developing TALONS for different platforms. In the Chesapeake Bay near Baltimore, the TALONS team improved hand-deployment techniques for smaller boats and sent the system up to 500 feet in altitude, tuning and programming automatic launch-and-recovery and autopilot systems. The Virginia Beach demonstration occurred several miles offshore and used a mast-deployment technique that extended TALONS’ reach to 1,000 feet in altitude to display the system’s utility for larger ships. TALONS is part of DARPA’s Phase 1 research for Tern, a joint program between DARPA and the U.S. Navy’s Office of Naval Research. Following successful testing, DARPA may transition TALONS technology to the U.S. Navy. 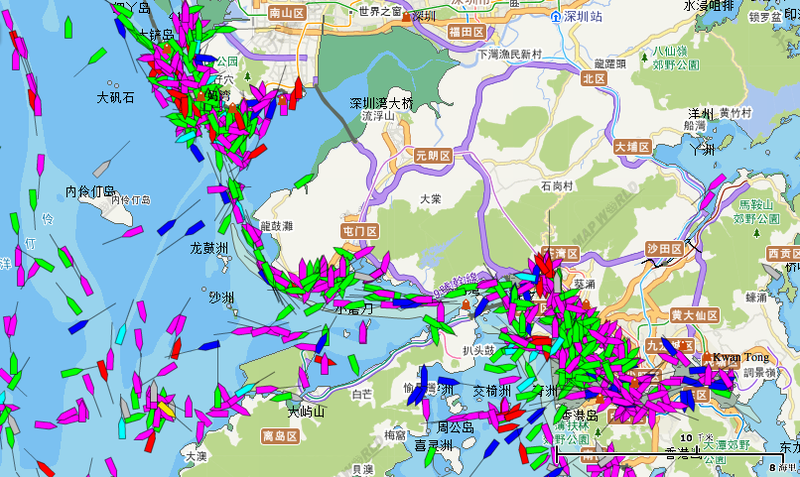 designed to deliver dramatic line-of- sight expansion to maritime assets. “Through SideArm, TALONS and other projects, DARPA aims to make it much easier, quicker and less expensive for the Defense Department to deploy persistent ISR and strike capabilities almost anywhere in the world,” said Dan Patt, DARPA program manager. in that video, the Ocean Initiative 2015 Project provides straightforward answers to this issue. The most important consequence of the Paris climate talks will be the fate of the oceans. On Nov. 30, more than 140 world leaders, including President Obama, will meet in Paris for the beginning of a historic two-week conference on climate change. There’s already been a flurry of voluntary national pledges, increasing confidence that the meeting will likely result in the first global agreement on emissions reductions. What they won’t be discussing, however (due to diplomatic quirks), is the effect of climate change on the world’s largest and most important ecosystem: the oceans. While COP21 is inaugurating a new phase of commitment on climate, the Ocean Climate Platform disclosed the content of its advocacy in order for ocean and coastal zones related issues to be gradually taken into consideration via specific measures and included in the various axes of negotiation. Oceans are a major global climate regulator: they cover 71% of the surface of the Globe, they produce over 50% of the oxygen in the air we breathe, they absorb approximately 30% of the CO2 and 93% of the excess heat generated by human activity. Limiting global warming to 2 degrees Celsius, or even 1.5 degrees Celsius, is essential to maintain the regulation capacity of oceans and to limit the current changes. In support of an ambitious universal and legally binding agreement, the Ocean Climate Platform points out that, Oceans remain the forgotten piece in the climate negotiation puzzle. As I wrote this summer in Rolling Stone, there’s increasing evidence that the world’s oceans are nearing the point of no return. They’re getting hit with a double whammy—rising temperatures and acidification—that together are forcing fundamental changes to the basis of the planet’s food chain. So far, the oceans have absorbed about 93 percent of all the additional heat energy trapped by rising greenhouse gas concentrations. 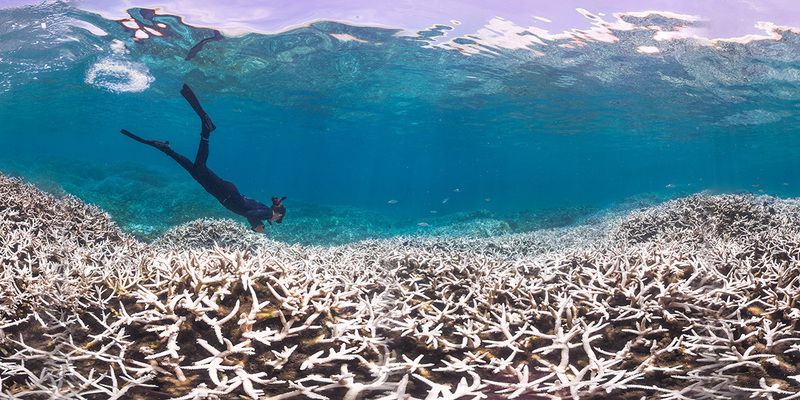 That’s already prompted the loss of about 40 percent of the world’s coral reefs, accelerated by a series of worldwide bleaching events in which exceptionally warm water temperatures prompt normally symbiotic algae to become toxic—the most recent of which was just this year. Since coral reefs—the “rainforests of the sea”—support a quarter of all marine life on just 0.1 percent of the ocean area, a mass extinction may already be underway. If we lose the oceans, we lose everything. Alice Lawrence, a marine biologist, assesses coral bleaching at Airport Reef in American Samoa. Water temperatures this year in the North Pacific have surged to record highs far beyond any previous measurements. That means krill and anchovies have been forced into a narrow corridor of relatively cooler water close to the shore, and predators like whales are feasting on the dregs of an ecosystem. Along the coast of California, there’ve been sightings of rarely present species such as white pelicans, flying fish, Mexican red crabs, and nearly extinct basking sharks. Last year, a subtropical Humboldt squid was caught in southern Alaska—along with a thresher shark that was also far from its natural range. After a startling number of starving baby California sea lions began washing up on shore a couple of years ago, a colony has taken up residence in the Columbia River in Oregon. Marine life is moving north, adapting in real-time to the warming ocean. But for how much longer? This year’s record-setting El Niño is fast-forwarding the effects of climate change, and it’s hitting the oceans hardest. As the ocean warms, coral reefs are already faltering. Sharks, which have been around for 450 million years—about 100 times longer than our hominid family—are vitally dependent on coral reefs. If all the other stresses they face don’t do it, the loss of the world’s reefs might do them in. Airport Reef in American Samoa before this year’s global coral bleaching event, seen here in December 2014. An even worse problem than rising ocean temperatures is acidification. As the oceans absorb carbon dioxide from the atmosphere, it’s converted into carbonic acid—and the pH of seawater declines. This is like being trapped in an acid bath for marine animals with hard shells. A striking study last year showed that tiny snails are already having their shells dissolved. Another study this July said that a continuation of business as usual would force an “effectively irreversible” change on ocean ecosystems this century. If we can’t count on the ocean’s productivity, what else may begin to unravel? Plankton produce half of the world’s atmospheric oxygen, and oxygen levels are already declining. There’s no serious threat—yet—to those of us who breathe air, but with the Earth going through geological-scale changes in the span of a single human lifetime, it may not always be that way. This is what is meant by the phrase: tipping point. To use an obvious pun, our planet is in hot water. For some perspective on mass extinctions, I spoke with Jacquelyn Gill, a paleoecologist at the University of Maine. Her Twitter profile features a family of peaceful-looking wooly mammoths. Airport Reef during the bleaching, in February 2015. Some scientists, like the University of Hawaii’s Ruth Gates, have begun to bridge the gap between conservation and mainstream oceanography. Gates and her team are using a technique called “assisted evolution” to essentially breed generations of new coral ecosystems suited for the Anthropocene, which they plan on eventually transplanting back into wild reefs. Barring relatively bold action in forums like the Paris meeting, Gill isn’t convinced that even these novel conservation methods will be enough to keep the oceans in a recognizable state by the end of the century. “There is such a thing as a point of no return in the environment,” she told me. What does too late mean? Airport Reef after the bleaching, August 2015. Ecologist Carl Safina knows the ocean well, but he doesn’t like to talk about tipping points. Safina said that thinking of environmental problems in terms of tipping points, especially those in the ocean, forces people into two opposite camps: the fatalists, and the deniers. But climate change is something different. For the first time in Earth’s 4.5 billion–year history, a single species has put the lives of nearly all others in jeopardy. Now that we’ve finally realized the mess we’re in, we can’t seem to stop perpetuating it. “There are problems that humans simply might not be psychologically and sociologically capable of dealing with appropriately on the appropriate time scale,” Safina said. Which brings us to the climate summit in Paris. The terrorist attacks of a few weeks ago are still fresh wounds. In the days immediately following, it was briefly an open question whether the talks might be canceled for security reasons. Ultimately, several unofficial but important aspects of the meetings were, in fact, canceled—and that’s unfortunate, but understandable. But the most heartwarming response was from the French president, François Hollande, who refused to entertain any discussion of canceling the talks. Let’s hope that beautiful sentiment is enough to inspire real progress. That’s the biggest problem with climate change action—the plankton, mollusks, and corals have no seat at the table. If—selfishly, even!—we want to have a planet where human civilization can thrive for decades and centuries to come, we can’t forget about the oceans. 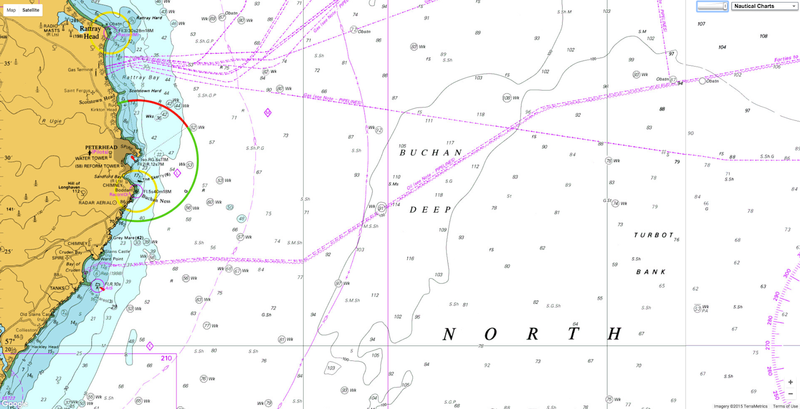 Statoil has made the final investment decision to build the world’s first floating wind farm: The Hywind pilot park offshore Peterhead in Aberdeenshire, Scotland. In a deal between the Scottish government and Norwegian oil company Statoil, five wind turbines with a capacity of six megawatts each will be set on floating structures some 15 miles (25 km) off the northeast coast of Scotland near Peterhead. The Hywind pilot park, as it's named, is claimed to be the first floating wind farm in the world, and will generate enough power for 20,000 homes with operations expected to start in late 2017. The 30-MW Hywind park will take advantage of average local North Sea wind speeds of around 19 knots and cover an area of around 1.5 sq mi (4 sq km) at a water depth of 310 to 395 ft (95-120 m). 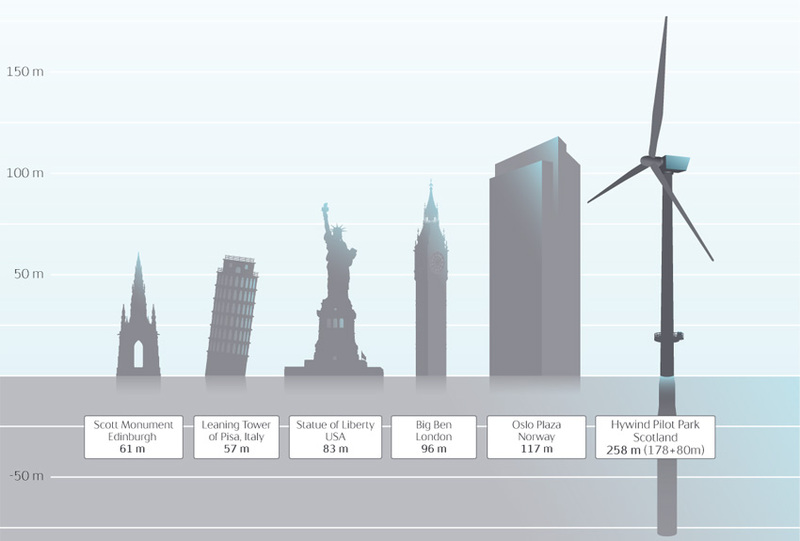 Floating wind turbines can be placed away from the coast in deeper water as they don't need to be anchored to sea floor-mounted towers, which are typically limited to a water depth of up to 260 ft (80 m). The optimal water depth for fixed turbines is 65 to 165 ft (20-50 m), however two-thirds of North Sea waters are between 160 and 720 ft (49 and 220 m) in depth. There are several advantages to locating away from shore, including reduced visual pollution – meaning they won't spoil anyone's view, which is a common complaint by some coastal residents. They can also reap the benefits of stronger and more consistent winds typically found farther out at sea since they aren't impeded by land features. Floating wind farms are also less likely to interfere with fishing or shipping activity, and by stringing the turbines together in a farm, they can share a common infrastructure, such as power cables and transmission facilities. The Hywind floating wind turbine technology has been in development for six years, with a 2.3-megawatt prototype installed in 720 ft (220 m) of water 6.5 miles (10 km) from the Norwegian island of Karmøy in 2009. It was the first large-capacity floating wind turbine to be put in use. The turbine generates 7.3 GWh, and has ably survived 36 ft (11 m) waves. Like the turbine off Karmøy, the Hywind Scotland pilot park turbines will be moored by catenary cables to a single floating cylindrical spar buoy. The ballasted catenary adds 60 tons (54 tonnes) of weight hanging from the midpoint of each anchor cable for added tension. Statoil believes its Hywind floating wind turbine technology will enable greater exploitation of offshore wind resources by allowing expansion into new deep-water areas around the world. under Hurricanes Kilo, Ignacio and Jimena is shown in this animation. Data from three satellite microwave radiometer missions: ESA’s L-band SMOS, NASA’s L-band SMAP and Japan’s C-band AMSR-2 are combined to reveal the track of each hurricane and maximum wind speed measured by each sensor at the ocean surface. ESA’s SMOS and two other satellites are together providing insight into how surface winds evolve under tropical storm clouds in the Pacific Ocean. This new information could to help predict extreme weather at sea. This year, a particularly strong El Niño is resulting in much higher surface ocean temperatures than normal. The surplus heat that is being drawn into the atmosphere is helping to breed tropical cyclones – Pacific Ocean monsters. With eight major hurricanes already, this year’s hurricane season is the fifth most active in the Eastern Tropical Pacific since 1971. At the end of August, three category-4 hurricanes developed in parallel near Hawaii. True-colour composite from the MODIS instrument on NASA’s Terra satellite of hurricanes Kilo (left), Ignacio (centre) and Jimena (right) on 29 August 2015. All three were category-4 hurricanes and spanned the central and eastern Pacific basins. The bright bands in the images are sunglint where solar radiation from the Sun has reflected from Earth back to the satellite sensor. The Copernicus Sentinel-3A satellite, expected to be launched in late 2015, will provide images such as these at 300 m resolution and in 21 bands from its Ocean and Land Colour Imager along with thermal infrared images from its Sea and Land Temperature Radiometer. A collage from NASA’s Terra satellite captured the Kilo, Ignacio and Jimena hurricanes beautifully. However, a special set of eyes is needed to see through the clouds that are so characteristic of these mighty storms so that the speed of the wind at the ocean surface can be measured. 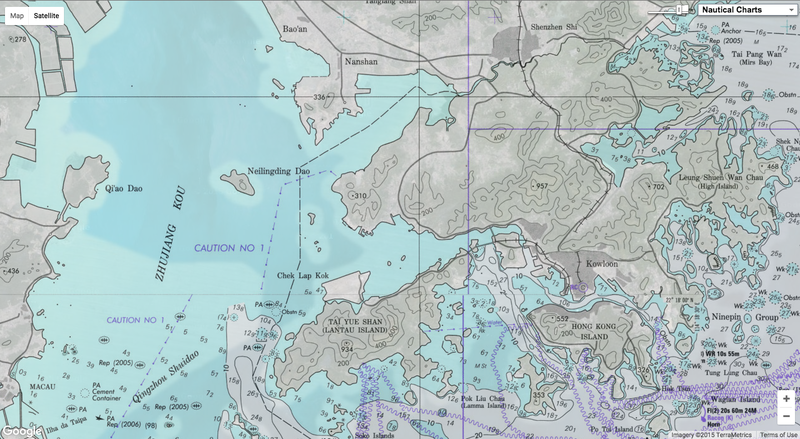 This information is essential to forecast marine weather and waves, and to predict the path that the storm may take so that mariners receive adequate warning of danger. The microwave detector on SMOS yields information on soil moisture and ocean salinity. Going beyond its original scientific objectives, ESA pioneered the application of SMOS measurements to study wind speeds over the ocean. Sea-surface temperature anomalies reveal cold-water wakes trailing behind the Kilo, Ignacio and Jimena hurricanes, highlighting the power these winds have in stirring the upper ocean and bringing cooler deep waters to the ocean surface. Air–sea interaction on this scale has implications for modelling teams at hurricane forecasting centres and for ocean forecasting systems such as the Copernicus Marine Environmental Monitoring Service. Taking this even further, measurements from two other satellites, NASA’s SMAP and Japan’s GCOM-W, which carry differing low-frequency microwave instruments, are being used with readings from SMOS to glean new information about surface winds under hurricanes. Combining data from multiple satellites in this way provides a unique view of how the surface wind speed evolves under tropical storms in unprecedented detail. This will greatly improve the information on the initial conditions of tropical cyclones fed into weather forecasting, and hence their prediction. Scientists from Ifremer in France and the Met Office in the UK are assessing these new data and how they could be integrated into hurricane forecasting. Measurements of sea-surface temperatures reveal cold-water wakes trailing the three recent hurricanes, highlighting the power these winds have in stirring the upper ocean and bringing cooler deep waters to the surface. Interactions between the sea and atmosphere on this scale have implications for hurricane forecasting centres and for ocean forecasting systems such as Europe’s Copernicus Marine Environmental Monitoring Service. 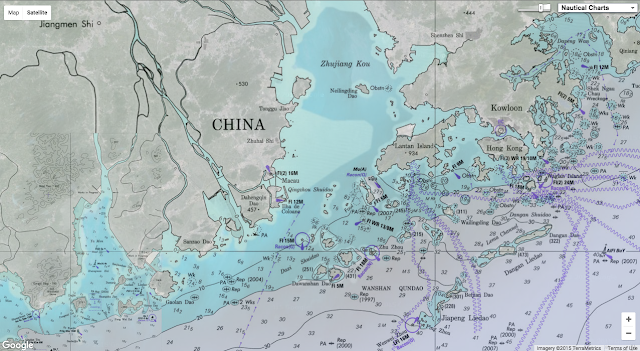 Nicolas Reul from Ifremer said, “In addition to improving marine forecasting, the combination of data from sensors on different satellites will definitively enhance our understanding of ocean–atmosphere interactions in intense storms. Craig Donlon, ESA’s ocean scientist, added, “Highlighting the societal benefits of new measurement approaches and Earth observation technologies is part of our core business. 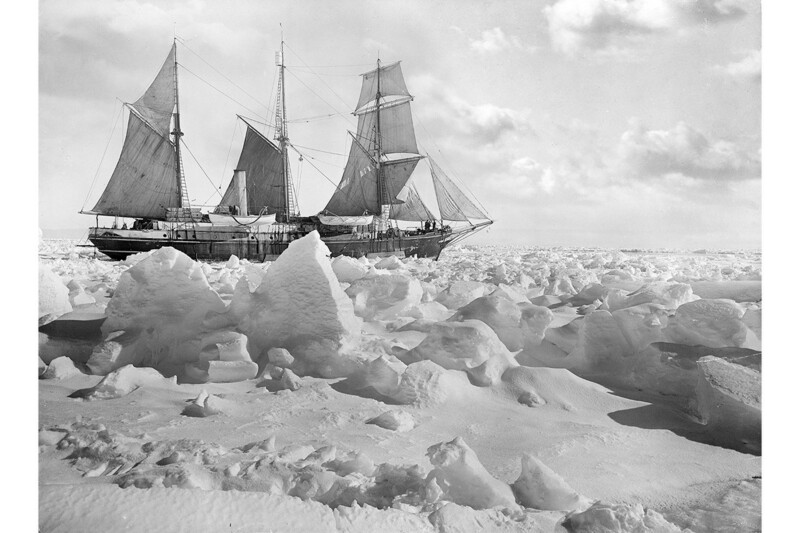 The Endurance in full sail, in the ice. The photo was taken when the crew felt they had a good chance of freeing the trapped Endurance from the sea ice of the Weddell Sea, so they put the sails up. 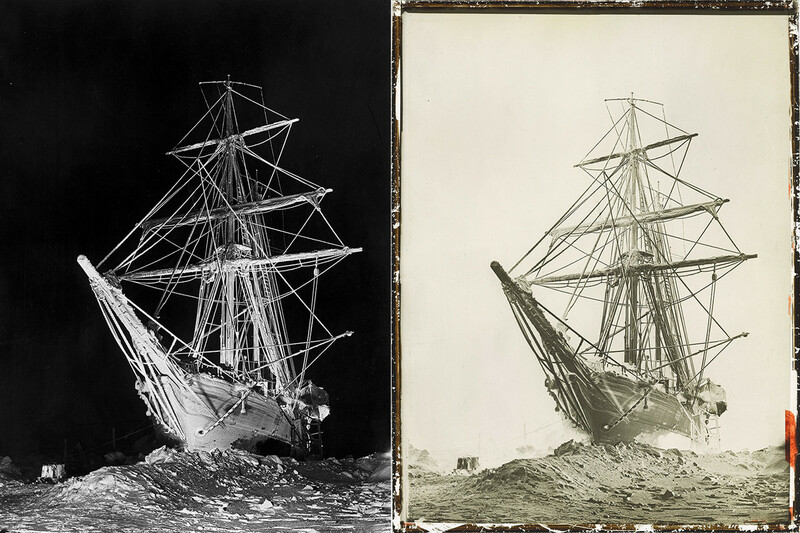 ​This and other attempts failed, and​,​ realizing the ship wasn’t moving, photographer Frank Hurley went onto the ice to take this photograph. ​Jan. 25, 1915. In the photography world’s equivalent of an IMAX event, devotees are about to get a hyperdetailed view of one of exploration’s great survival stories. Sir Ernest Shackleton and his crew took bitter defeat and turned it into heroic survival. Early this century, members of the imperial Trans-Antarctic Expedition watched as their ship, the Endurance was crushed by the frozen sea. They were left with no radio and no hope of rescue. For more than a year, they drifted on packed ice, surviving on seal, penguin, and eventually dog meat, while battling freezing temperatures and mind-numbing boredom. When Shackleton, along with all 28 members of the expedition, emerged at Stromness whaling station in May, 1916, almost two years after their departure, the world was shocked. Beginning in 1914, the British explorer Ernest Shackleton took the sailing vessel Endurance to the Antarctic as part of an ambitious expedition meant to traverse the continent. The ship became icebound, finally sinking on Nov. 21, 1915, and stranding the ship’s 28 men. While most of the crew, including the expedition’s official photographer, Frank Hurley, waited on uninhabited Elephant Island off the Antarctic coast, Shackleton and a few of his men made an 800-mile sea voyage in a lifeboat, eventually reaching the South Atlantic’s South Georgia Island. They climbed glacier-topped mountains to reach a whaling station, where Shackleton arranged a rescue of the rest of his crew. The Endurance’s entire crew survived, and Hurley’s photos are a haunting visual account of the ordeal. Beginning Saturday, London’s Royal Geographical Society, the main repository of Frank Hurley’s glass-plate and Kodak negatives of the journey, will honor the centenary of the Endurance’s sinking with the debut of digital versions of the photos, along with several objects that survived the voyage. 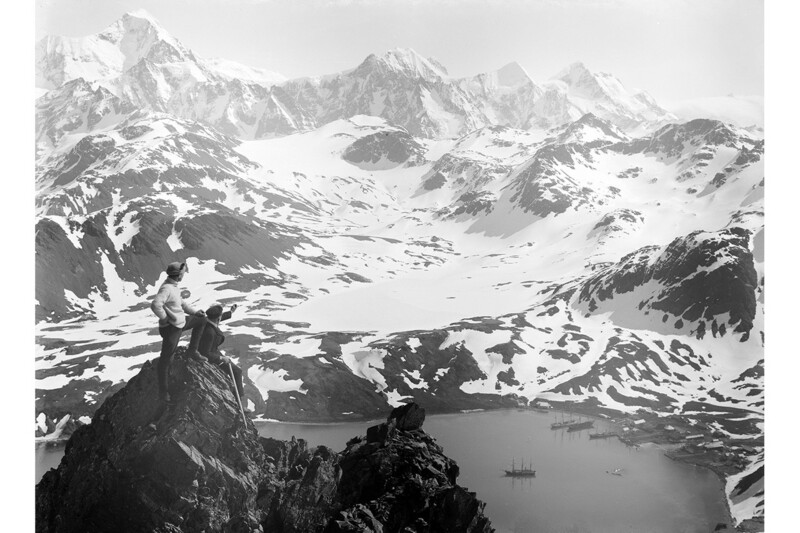 “The Enduring Eye: The Antarctic Legacy of Sir Ernest Shackleton and Frank Hurley” ends Feb. 28 and will later tour to other U.K. sites, the U.S. and Canada. The itinerary hasn’t been announced. 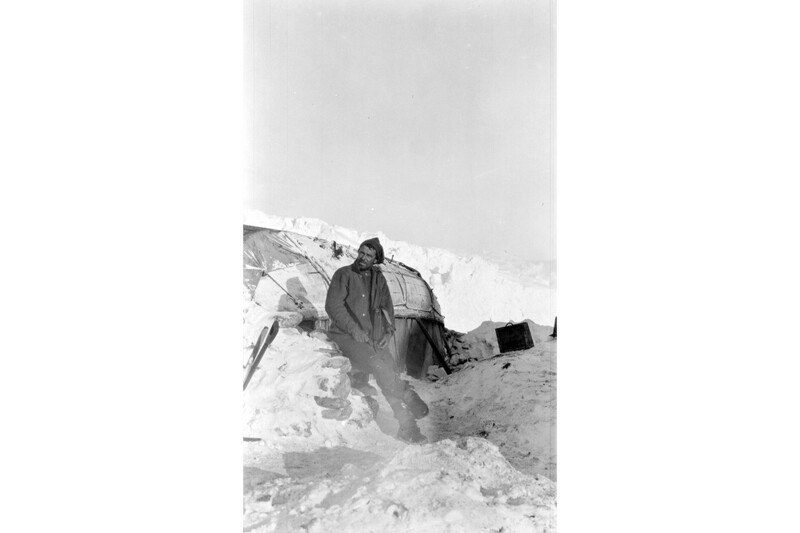 '​On the ​D​​rifting ​F​low “​​Ocean​”​ Camp' ​(Oct. 30, 1915) | Shackleton stands by his tent shoulder​-​to​-​shoulder with his second in command Wild. Scientists and officers stand in midground and the crew at the back. 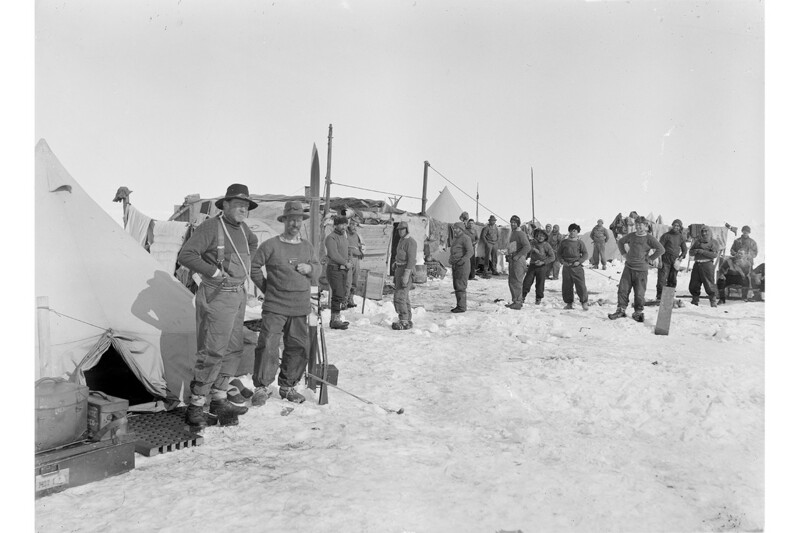 The London version of the show includes 97 Hurley photographs along with objects such as a Union Jack presented to Shackleton by King George V and meant to be flown at the South Pole. The flag made its way back with the rescued crew. 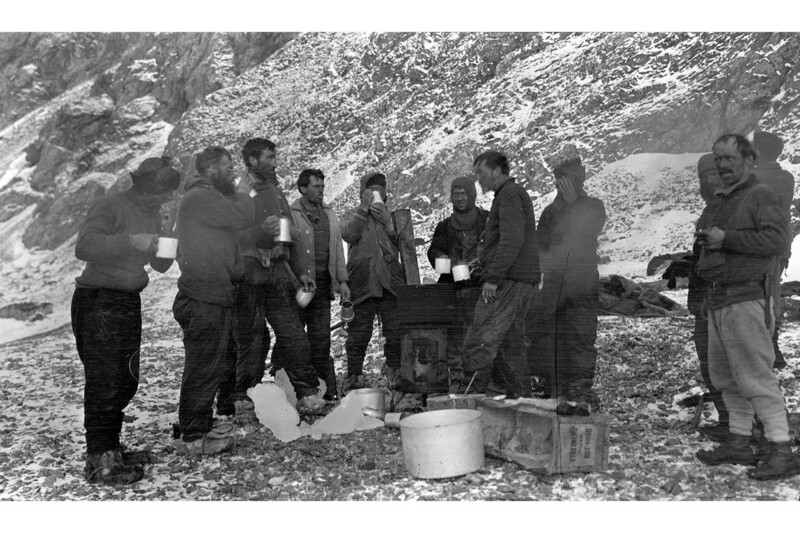 Expedition members take a hot drink. The file sizes of previous digital versions were about 4 megabytes each, while the newly scanned versions are about 1.5 gigabytes. Photographer Frank Hurley with his Vest Pocket Kodak outside the hut. The exhibit has developed the new digital scans into oversize prints, some more than 8 feet long. “Hurley always intended his images to be several feet across,” says Mr. Macleod. 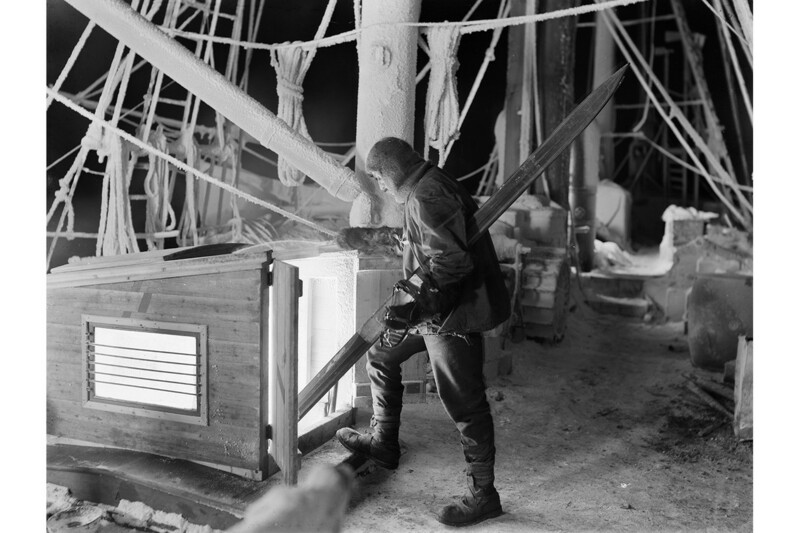 An exhibition is shedding new light on the Antarctic expedition by British explorer Ernest Shackleton a hundred years ago.His ship was trapped in ice for months before he led his men to safety. In addition to revealing previously unseen details of the images—like the names of the books the crew was reading—the new digital versions will be able to show “how the ice looked” at the time, he adds. That could help climate scientists track changes to the continent’s ice cover. See the sport of surfing as it’s never been captured before in John Florence and Blake Vincent Kueny’s second signature release, in association with award-winning film studio, Brain Farm. The first surf film shot entirely in 4K, View From a Blue Moon follows the world’s most dynamic surfer John Florence and his closest friends from his home on the North Shore of Oahu to his favorite surfing destinations around the globe. From the dreamy blue perfection of the South Pacific to the darkest uncharted waters of Africa (and everywhere in between), Florence faces a broad spectrum of emotions as he continues to seal his legacy as one of the most gifted surfers ever. And while the young Hawaiian is pulled in increasingly different directions, there is no form of pressure that will keep him from his ultimate goal — to redefine what is possible in the ocean.